It is amazing that a small piece of plastic that fits in your wallet can lead to such huge financial problems. But the fact is that credit cards do not make bad decisions; it is what you choose to do with them that can lead to serious problems. Consider the following pros and cons of credit card use the next time you are tempted to pull out a piece of plastic. Should you use credit cards? Pro: Having access to credit can be helpful in an emergency. Let's say your car breaks down in the middle of nowhere, and you don't have access to an ATM to get cash. You could have your vehicle towed to a mechanic and use a credit card to pay for the repairs. Con: Saving money for an emergency fund can help you avoid running up credit card debt because of emergencies. If you had enough money available in savings, you could write a check for the car repair or even pay off the credit card bill for the mechanic's work when you get back home. Pro: Credit cards are useful when traveling. Not only do they make reservations a snap, but they can also provide protection in the event your cards are lost or stolen. When you lose cash, it's probably gone for good. Con: Unless you set up a specific travel budget before leaving home, you may end up overspending while vacationing. It can be easy to throw caution to the wind and load up on souvenirs and keepsakes, eat at too many pricey restaurants, or go overboard on site-seeting when a credit card is footing the bill. Pro: A credit card can help pay for college expenses when you are short on cash. No one wants to see their kid miss out on getting an education. Though many colleges no longer accept plastic for tuition, swiping a credit card for books and other expenses for the semester may be preferable to falling behind. Con: Giving credit cards to students can result in financial disaster. Students may not have had enough financial education to make the right decision when deciding whether or not to treat their dorm floor to pizza with your card. Avoid making spending decisions without a plan in place. 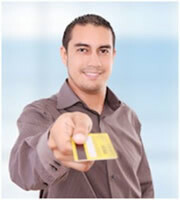 Decide how you intend to use credit cards before leaving home to avoid running up too much credit card debt. If you don't trust yourself to make good choices, ditch the credit cards. 0 Responses to "Pros and cons of credit card use"